Tynemouth’s Andrew Smith and David Hymers held their nerve to secure a famous win at the County Ground with an eighth wicket partnership of 28 which saw the Seasiders home in dramatic circumstances against local rivals Newcastle. Earlier Newcastle skipper and former Leicestershire stalwart Jacques Du Toit had won the toss and elected to bat on a dry looking and used pitch on a glorious day for cricket. 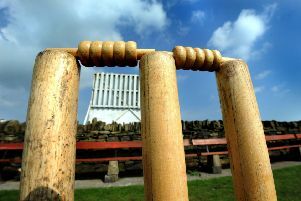 Tynemouth skipper Ben Debnam threw the new ball to Andrew Smith for the first time this season and, along with Finn Lonnberg, the Tynemouth opening pair had the hosts in serious trouble at five down for just ten runs off only the first eight overs. Lonnberg had the dangerous Australian Nick Hobson caught by Hymers mistiming a hook, then Smith had Micky Allen caught at point by a juggling Chris Fairley. Lonnberg then sent former Tynemouth junior teammate Ollie McGee back to the pavilion for a duck, bowled with a beauty, and when Smith dismissed Durham player Graeme Clark and Chris Youlden, the home side were in crisis. Du Toit survived confident lbw appeals from both opening bowlers but then counter attacked with style and, along with James Carding, moved the score along to 65 before Smith had him lbw just one run short of a half century. Carding with a gutsy 29, and Tindale with a determined 12, moved the score along gradually, but Smith in an extended and high class spell of away swing bowling, removed both to once again have the hosts reeling at 107-8. But this Newcastle side is a determined one and the tail wagged nicely with Neil Corby (19) , Callum Harding (24) and last man Richard Stanyon (14 not out) lifting the home side to 155 all out and give them some chance of a victory. Smith with 6-65 off his 20 overs was the pick of the Tynemouth attack along with Lonnberg, whose 14 overs brought two wickets for just 29 runs and included a high class seven-over opening burst. Tynemouth’s reply did not start well, with opener Nick Armstrong adjudged lbw for nought after playing across a straight one from Sean Tindale. This brought former Pakistan Test star Taufeeq Umar to the crease to join skipper Debnam. Taufeeq showed quality but also determination and added 62 for the second wicket before Debnam misjudged a single and was run out for 24. Matthew Brown joined Taufeeq and they moved the score effortlessly passed the 100-mark before Brown played on to a ball from McGee, who was bowling well from the Osborne Avenue end of the ground. At tea Tynemouth looked in control at 105-3. But the break seemed to come at the wrong time for the visitors, who then lost wickets quickly after the break. On 107 both Richie Straughan and Taufeeq went, and when Fairley, Niall Piper and Lonnberg were dismissed in quick succession, Tynemouth were reeling at 130-8, still needing 26 runs for victory. Hymers then joined man of the match Smith at the crease and with lots of time remaining the two showed great composure and technique to slowly edge the away side towards their target. McGee and Michael Allen fought hard for their team but when Allen bowled Hymers the umpire held up his arm to signify ‘no ball’ and with that reprieve you just knew it was going to be Tynemouth’s day. So it soon was with both batsmen not out on 17 and Hymers hitting the winning runs to the delight of their team and supporters. A fine, competitive game of cricket that swung one way and then the next before one last sting in the tail saw Tynemouth prevail and keep alive their outside title hopes. This Saturday sees Stockton travel to Preston Avenue, and with Taufeeq in the side the Seasiders will be looking for another win and a bumper crowd to watch the little master bat. The game starts at 11.30am and the bar is open for members and visitors all day.